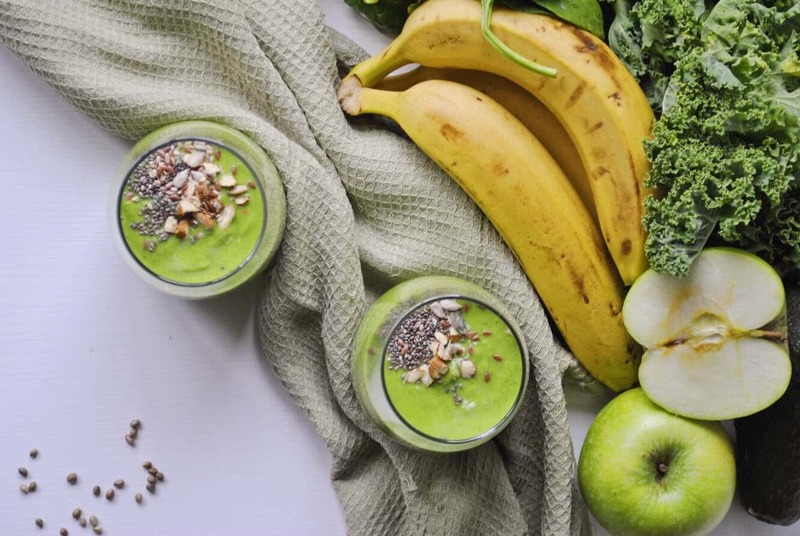 This gut healing green smoothie packs a punch that will leave anyone feeling green with envy! 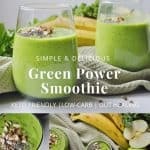 It is loaded with fruits and veggies such as kale, spinach, apple and banana, gut healing foods like ginger, hemp seeds, as well as chia seeds and flax seeds. So what’s the deal with hemp hearts? When it comes to taste hemp seeds have a mild and nutty flavours, they also contain over 30% fats. Hemp is commonly confused with marijuana. It belongs to the same family, but the two plants are very different. Marijuana is grown to contain high amounts of tetrahydrocannabinol (THC), the chemical that is responsible for its psychoactive properties. Hemp describes the edible plant and seeds, which have all the health benefits and none of the ‘marijuana’ effects. Hemp also contains a rich source of protein, this includes all 10 essential amino acids, making it a good plant-based protein source. Optionally you can also add some grass-fed collagen powder for extra amino acids and a gut healing boost! We hope you enjoy this protein-rich, gut healing smoothie. Place all ingredients in a blender and blend on high until smooth (about 2–3 minutes).